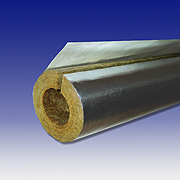 PAROC Pro Section 100 G7 is a pipe section for pipe insulations on ships. Product has a white glass fibre clothing with aluminium facing. Maximum service temperature for PAROC Pro Section 100 G7 is 250°C.Surface temperature of the facing must not exceed 80°C (temperature restriction determined in accordance with heat resistance adhesive). Values announced by the manufacturer.